1. The canonical Wnt pathway, also known as classical, activates target genes through stabilization of β-catenin in the nucleus. The function of this pathway during embryonic development has been originally elucidated by experimental analysis of axis development in the frog Xenopus laevis and of segment polarity and wing development in the fly Drosophila melanogaster. 2. The planar cell polarity pathway involves RhoA and Jun Kinase (JNK) and controls cytoskeletal rearrangements. Its main role is the temporal and spatial control of embryonic development, as exemplified in the polar arrangement of cuticular hairs in Drosophila or the convergent-extension movements in Xenopus embryos. 3. 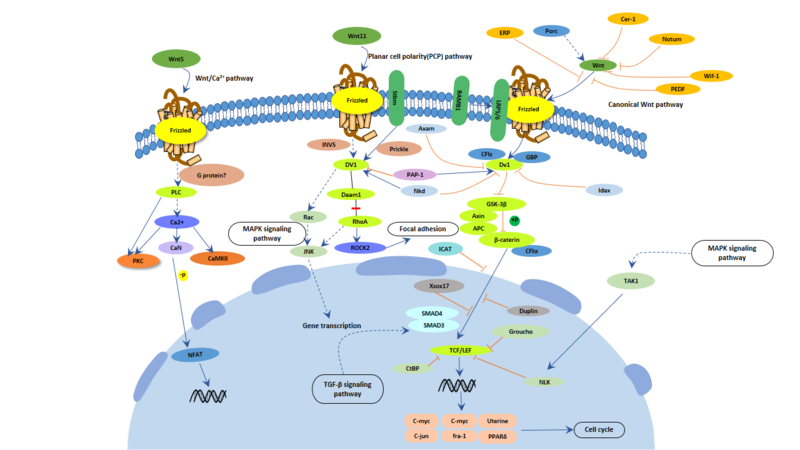 The Wnt/Ca2+ pathway is stimulated by Wnt 5a and Wnt 11 and involves an increase in intracellular Ca2+ and activation of Ca2+-sensitive signalling components, such as calmodulin-dependent kinase, the phosphatase calcineurin, and the transcription factor NF-AT.